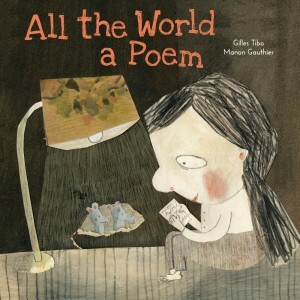 All the World a Poem by Gilles Tibo with illustrations by Manon Gauthier has received its first review from Quill & Quire. Gilles Tibo was already a well-loved children’s illustrator when he turned his hand to writing, and he has been prolific and successful in both fields. 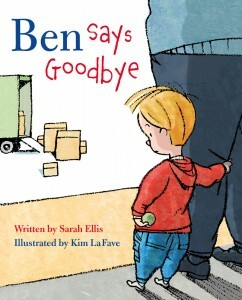 In his engaging new picture book, he celebrates his love of language and particularly the pleasures of writing poetry. Tibo’s verses and prose poems (translated by Pajama Press managing editor Erin Woods) playfully consider the experience of poetry—how poems may climb under his quilt at night and keep him awake, or how writing poetry can resemble plucking silence like a flower and gently pressing it “into a notebook made of light.” Unexpected similes and metaphors help the reader see poems in many ways, linking them to nature, feelings and the joy in life. 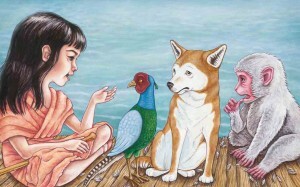 While there is fun in a good—or a whole string of them—the figurative language is more effective than the rhymed verses. 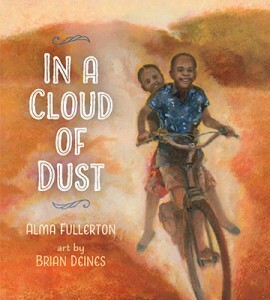 Certain concepts—including that poems “are infinite inside”—might be difficult for kids to comprehend, but the emphasis on sensations such as flying and floating, feelings of affection and companionship will bring the poems into relief for the young child hearing them. The poetically quirky spirit of Tibo’s text is well served by the playful collage illustrations of Manon Gauthier. The text (sometimes running on an angle across the page) and images are placed in interesting and varied relationships, and Gauthier uses earthy colours and strong contrasts between white pages and patterned or dark backgrounds. The illustrations richly reflect the poems’ celebration of nature; of night with its associations of imagination and creativity; of the pleasures of poems that float in from the sea, drop from the sky or sprout from the earth for us to hold in our hearts. Click here to read more reviews from Quill & Quire. “Alberta-based Geoffrey Bilson Award-winning author Karen Bass draws on the Cree legend of the Wîhtiko for her latest YA novel, which blends adventure, horror, and some good old-fashioned coming-of-age wisdom. En route to spend the summer with his mining-executive father in Yellowknife, 15-year-old Jared Fredrickson’s private jet crashes in a remote swamp in Northern Alberta. He regains consciousness as a rescuer enters the scene—Kyle Badger, a Cree teen (also 15) who happened to be nearby and saw the plane go down. After bandaging the unconscious pilot’s bleeding head (there are no other passengers or crew), Kyle helps Jared out of the wreckage, and the latter convinces the former to climb a nearby hill in the hopes of getting some cellphone reception and calling for help. Kyle is more than reluctant. His Kokum (grandmother) has always warned him to stay away from the hill, which is said to be cursed. But Jared is insistent, and the two boys set off on a quest that will lead them straight into the path of mortal danger. Jared and Kyle could not be more different. Raised in Edmonton by extremely wealthy parents (now divorced), Jared wants for nothing. He is small in stature and obsessed with material goods; he worries more about his damaged laptop than the injured pilot. He also has zero survival skills. Kyle, on the other hand, is the size of a large adult man, shares a small home with his grandparents and younger brother, and is obviously comfortable in the wilderness. It quickly becomes clear that Jared doesn’t stand a chance of surviving without Kyle’s help, though the two don’t exactly hit it off. Kyle sees Jared as a spoiled, oblivious white kid, while Jared considers Kyle an overbearing bully who uses his size as an intimidation tool. The racial tension runs high, with Jared making ignorant—though not necessarily ill-intentioned—comments about aboriginals and Kyle referring to Jared as Moniyaw. “[It] isn’t an insult. It just means white man,” says Kyle when Jared’s temper flares at the perceived slight. “And if I called you ‘brown man,’ you’d flatten me,” responds Jared. The dynamic between the boys is the best part of the narrative, and will open many readers’ eyes to the issues of race, class, and privilege. Neither Kyle nor Jared are bad kids, but they both have faults, and their process of figuring those out and coming to terms with them comprises the bulk of the story not dealing with their bigger problem: the Wîhtiko. Bass does an excellent job of bringing together the elements of her novel, successfully weaving the supernatural thread into what would be a challenging situation for the boys even without it. 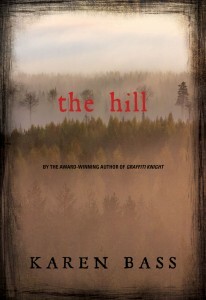 Their climb up the hill releases the Wîhtiko from its lair and traps them in a parallel dimension where monsters and figures from legend are real, and the boys’ world—including the crashed plane and Kyle’s family—is rendered inaccessible by a strange fog that allows them to see, but not cross over. 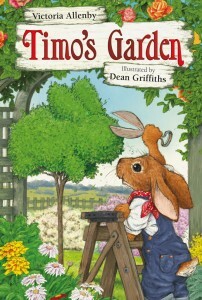 “Encouraged to sign up for Toadstool Corners’ Great, Green Garden Tour, rabbit Timo begins feverishly planning and improving his garden. With rhythmic pairings of activity (“He trimmed and he tidied. He hurried and he scurried. Her raked and he staked. He worked and he worried”), Timo toils with boundless determination and relentless perfectionism, leaving little time to spend with his friends. Though tempted by Hedgewick’s spinach cakes, a visit to the lake, and tennis with Suki, it is only when a rainy day interrupts his efforts that Timo realizes he should have been tending to his friendships instead of his plants. With deft pen and colour, respectively, author Victoria Allenby and illustrator Dean Griffiths pay homage to the characters (rabbit, hedgehog, mouse, frog, and badger) and gardens in the stories of Beatrix Potter while providing a light, cautionary tale about finding balance. Unlike Allenby’s fun 2013 picture book, Nat the Cat Can Sleep Like That (Pajama Press), which focused on true feline behaviour, Timo’s Garden takes an anthropomorphized approach and will speak to any reader who might get too wrapped up in seemingly important endeavors. Brian Deines’ radiant oil paintings glow with orange and yellow background washes. An aerial view of Anna standing by herself after all the bikes have been claimed highlights the girl’s initial isolation and disappointment. The warmly realistic images of Anna helping Leyla learn to balance, and Prisca laughing after taking a tumble, nicely capture the children’s indefatigable spirits. How does it feel to be surrounded by people who see you as the enemy? How do you protect yourself when you aren’t sure whom to trust? 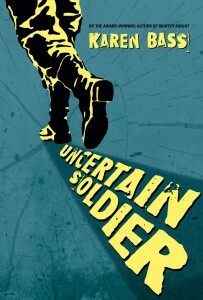 The protagonists of Uncertain Soldier, Karen Bass’s wonderful new novel for young adults, are grappling with these questions. Erich, a 17-year-old German sailor in Hitler’s navy, finds himself in Canada after his ship sinks and he is captured. Max is the 12-year-old son of German immigrants living in the fictional town of Horley, Alberta. Their stories converge in 1943, when Erich, now a prisoner of war, is working in a logging camp near Horley. Both boys share a deep feeling of isolation. Erich does not share his fellow POWs’ Nazi beliefs, but is nonetheless hated by any Canadian with whom he comes into contact. Max was born in Canada but his stern father’s loyalty to Germany causes suspicion when war breaks out, and Max becomes a target for the townspeople. Erich and max are well-developed characters, as is almost everyone surrounding them. Cora, a young Canadian girl whose relatives were killed in the Blitz, is torn between her hatred of the Germans and her attraction to Erich. The presence of Christmas, a young indigenous man, forces Erich and Max to realize that, despite their frustration with the blind prejudice of others, they harbor their own racial biases. Bass does a fantastic job building and releasing tension throughout the novel. That war and violence were omnipresent in everyone’s lives during the period is made plain, despite the deceptively peaceful setting of a town far from the front lines. In the end, Erich and Max are pushed to their breaking points and have to decide how to respond. Will they refuse to engage or will they stand up and do what’s right, despite the risks? Their feelings of helplessness and struggles with conflicted loyalties should be easy for any young reader to identify with. “Captain Barnacle is a good pirate: he’s saucy, bold, and selfish. So is his scurvy-ridden crew. His daughter, Augusta, however, is good natured and helpful, and thus a terrible pirate. When she offers to fix a rip in their ship’s sail, she is chastised for being too nice. Her father roars, “If I find a kindhearted matey on board, yez be the one feedin’ the fishes!” In an effort to please her father and show she can be bad, Augusta throws fellow pirate Scully’s peg leg overboard, though she feels sick with guilt afterward. When a storm threatens the ship, Augusta defies orders and scurries up the rigging to repair the sail, averting disaster and proving she can be saucy and bold without being selfish. 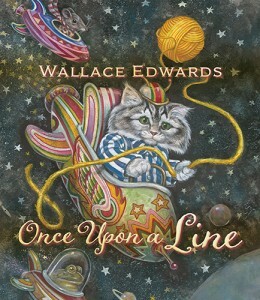 Her altruistic actions cause her father to revise his rules and opinion of what makes a good pirate. 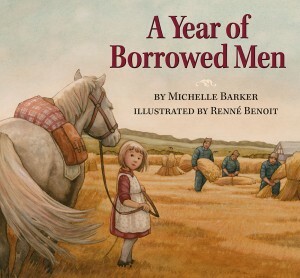 This is a delightful book with a take-charge female protagonist who rejects her father’s expectations of stereotypical behavior and remains true to her own values. Kari-Lynn Winters’ text is as spirited as Augusta herself, sprinkled liberally with pirate slang and nautical terms (all helpfully explained on the endpapers). Veteran artist Dean Griffiths’ clever illustrations are filled with movement, drama, and visual jokes, often depicting the action from different perspectives (atop the main mast, water level outside the ship). 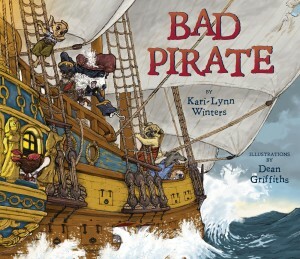 The characters are dogs of different breeds dressed as pirates—a visual pun on the term “sea dogs”—and have wonderfully expressive, human-like faces. Captain Garrick wears a hook in place of one paw—a sly reference to the infamous Captain Hook…[T]his rollicking story will charm pirate fans young and old. —Joanne Findon, a writer in Peterborough, Ontario.